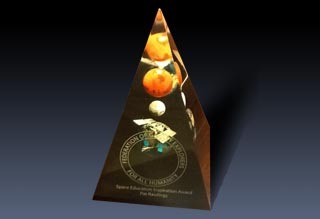 Pat received the 2012 Space Education and Inspiration Award at the 2012 Galaxy Ball. 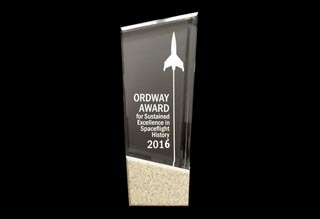 The award was presented by previous recipient Bill Nye, The Science Guy, and Nick Eftimiades, FOGE Chairmain. Pat's website has had over 140 new pictures added with updates to the bio, news, links,and search sections. There are many new categories to search in the 500 item database. 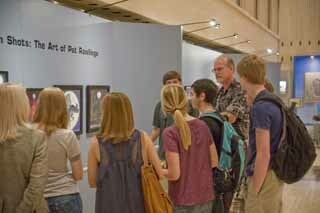 The LBJ presidential Library on the University of Texas campus features a one-man show of Pat's lunar themed art from May 15-September 8. Wired news interviews Pat on the ins-and-outs of being a space artist producing artwork for NASA. 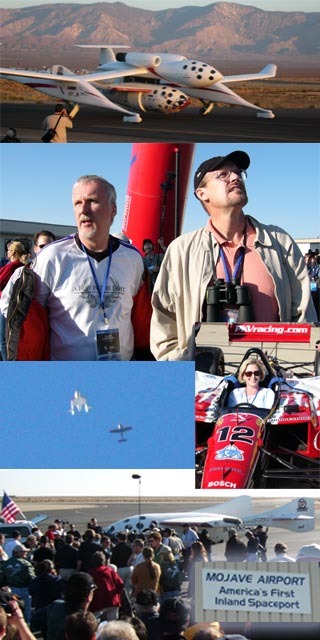 Pat and wife Linda attended the launch of SpaceShipOne from Mojave Airport. The White Knight "mothership" carrying SpaceShipOne took off just a few feet from the VIP viewing area. Viewers were later able to watch the entire rocket boost sequence with the unaided eye as well as a live telecast on a Jumbotron display. After watching the image on the screen rotate dramatically as the rocket went into a spin the image stabilized as Pilot Mike Melvill corrected the vehicle's attitude. About 30 minutes later SpaceShipOne landed on a strip very close to the viewing area. What a trip! On October 5, 2004 a 9' x 27' mural by Pat Rawlings with assistance from Faisal Ali will be unveiled at 7 pm. This mural is the largest digital image ever produced by the artist. The New York Times commissioned Rawlings to produce an image of a recently discovered planet around star Gliese 436. 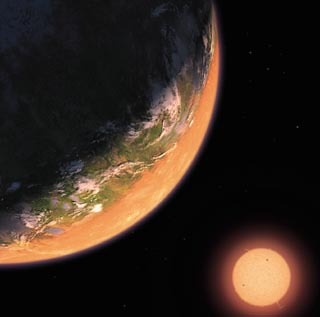 This tidally locked palnet might have a habitable zone around the terminator. 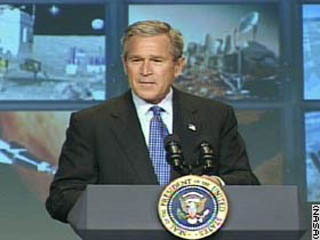 The image ran as a 1/2 page cover illustration on the 9/21/04 Times' Science News section. 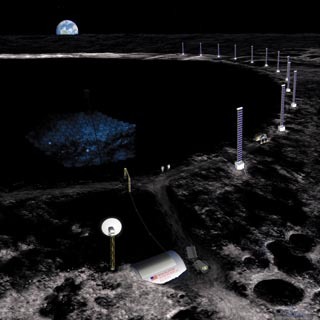 Astronomy magazine commissioned an illustration of Very Large Space Telescope which may be located in a permanently shadowed crater at the Moons south pole. This illustration appeared in the October 2004 issue of the magazine. 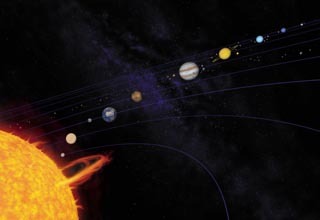 In this commission for Popular Mechanics the artist created a diagrammatic 2 page spread image of the Solar System. On January 14, 2004 President George W. Bush announced a new exploration plan for the U.S. against a backdrop of exploration images - 11 of which were created by Pat Rawlings. 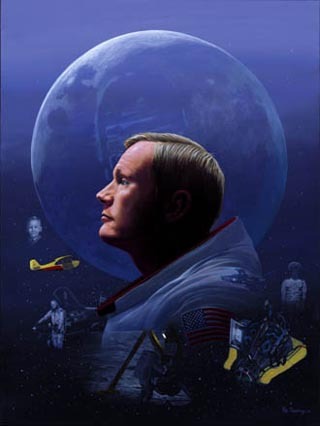 Pat Rawlings was selected to paint the official portrait of Neil Armstrong for the 2004 Rotary National Space Achievement Award.